Sisters & Best Friends Amy and Koneta are STILL sisters and best friends... but have decided to split their design company into two new ones! Sister's patterns will slowly retire as each is sold out... because that company no longer exists to re-print them! Here is a cheerful little ark... bursting with animals, and Noah! Is the rain cloud leaving and sun coming??? ... or the other way around?! Offered as a leaflet with a delightful set of colorful buttons and a smattering of beads, the thread list uses 29 different colors of DMC, Crescent Colours, Weeks Dye Works and Sampler Threads! 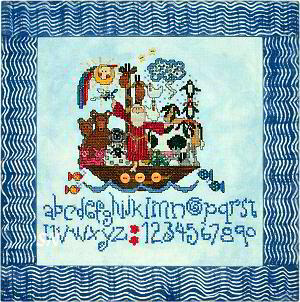 This piece is so full of color, you'll love stitching it! Worked on 18ct linen, over two threads, using 4 strands of floss, Noah finishes an impressive 11 x 13! No special stitches, just lots of personality! A proven fact -- you've just seen it in print and stitched On The Internet!!! To our beautiful customers, who must not be doing enough housework... this is published documentation, based on a lengthy, scientific study that YOU are on the right track in life! To remain as beautiful as you can be, simply purchase this chart and don't clean to make room for it in your stash! If you stitch it, rather than framing the leaflet itself -- it'll finish approx 10 x 11 on 10ct Tula or 19ct linen -- it's plenty large enough to cover a messy wall, no cleaning required. 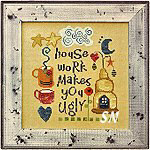 (Why spend hundreds of dollars annually on cosmetic products, when you can simply stop house cleaning... and be a lovely -- and probably better -- stitcher for it?) 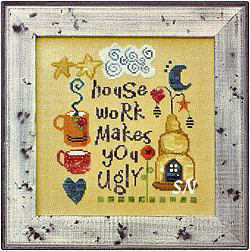 Sisters has brought us this delightful, whimsical chart that just brings a smile to your face! This is one of my absolute favorite finds at the recent Market! Oh my gosh -- so many places to hang this -- so many people who I could give it to -- but, wait... am I supposed to keep it on MY office wall??? I'm so confused... What I DO have straight, however, are the details about this charming piece! 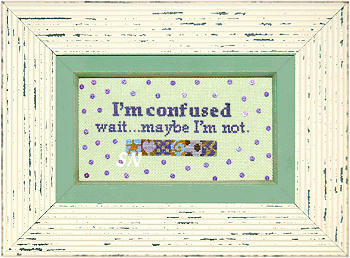 Offered as a chart, its stitched over one on the yummiest, pale shade of 19ct Mint Green Cork Linen, in a smattering of Crescent, Weeks, Gentle Art and DMC, and is embellished with 40 teeny-weeny deep grape micro-mini buttons! You can see them all over on this... they're all the little dots that are trying to confuse me!!! Finishing into a 4 x 7 frame... you can place those button dots where-ever, in case your frame is a different size. (Confused?... maybe not!) Quite cute, quite a definite!!! Sisters has lots of other new stuff -- just scroll down to check it all out!!! Well... this just reports half the story... as I'm not the MAID!!! 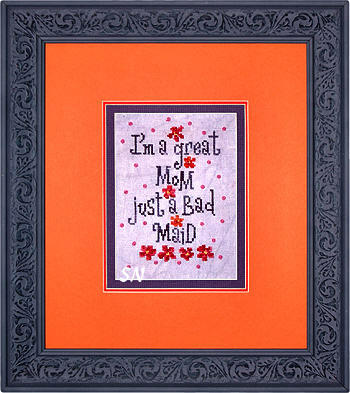 Cute for your kid's rooms... this is offered as the single chart, and finishes approx 5 x 6.